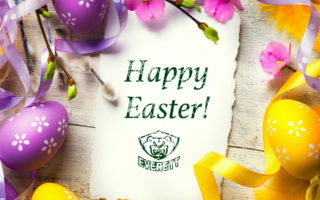 EVERETT, Wash. – The Everett Silvertips stuffed the stat sheet tonight as eight different Silvertips recorded points along with a 34-save outing from the reigning WHL Goaltender of the Week, Dustin Wolf, defeating the Portland Winterhawks 4-1 before 3,024 fans at A.O.T.W. Arena on Wednesday night in U.S. Division action. 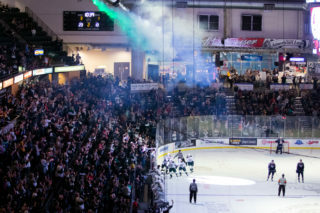 The Silvertips rallied back from a 1-0 first period deficit, to score four unanswered goals and land a total of 41 shots on visiting goaltender Shane Farkas. Sean Richards scored the eventual winner, capping a pair of goals in 47 seconds. UP NEXT: The Western Conference-leading Silvertips return to action at home on Friday, Nov. 30, against the Spokane Chiefs at 7:35 p.m. (1380 AM / 95.3 FM / Tips App / WHL Live). 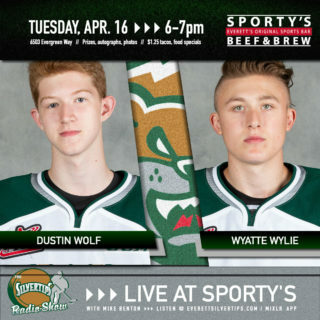 Tickets for Hockey Happy Hour presented by Broad Stroke Associates are available at www.everettsilvertips.com/tickets. Winterhawks 2002-born forward Cross Hanas struck first with a goal from the right circle at 10:22 into the first, created by a hail mary pass from defenseman Clay Hanus near the Portland bench. Wolf turned away 13 of 14 shots on net in the opening frame as the Silvertips landed 11 shots on Farkas, who turned away all the shots he faced in the first. Everett forward Reece Vitelli tied the game, 1-1, at 14:40 of the second initiated by breakout pass from defenseman and Flyers prospect, Wyatte Wylie. Vitelli crashed the net hard with an opponent on his back but was able to poke the puck through the Farkas’ legs. Just 47 seconds after Vitelli’s goal, Silvertips forward Sean Richards netted another Everett goal at 15:27. A two-on-one break led Silvertips captain Connor Dewar to fed Richards, who connected a beautiful backhand shot. The Silvertips had the edge on shots in the second period, where the Tips nailed Farkas with 17 shots, compared to Wolf, who stopped 11 of 11. 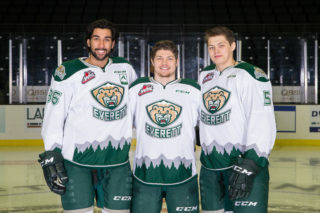 Almost five minutes into the third period, Silvertips import-forward Martin Fasko-Rudas put the Silvertips up 3-1 with an insurance goal at 4:45 assisted by defensemen Sahvan Khaira and forward Luke Ormsby as he successfully walked out from behind the net. The Winterhawks pulled Farkas at 18:29, which led to a Dewar empty net goal at 19:02. 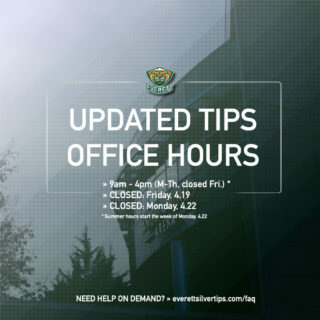 NOTES: Silvertips scratches included Ronan Seeley, Gianni Fairbrother and Bronson Sharp … The Silvertips are ranked #6 in the CHL Top-10 rankings … Dustin Wolf enters this week coming off his third WHL Goaltender of the Week honor … The Silvertips are 17-0-0-0 when they lead after two periods this season … Connor Dewar has points in 16 of his last 18 games … the Tips are ensured of no worse than a split in the season series, improving to 5-2-0-0 against Portland (10 meetings).